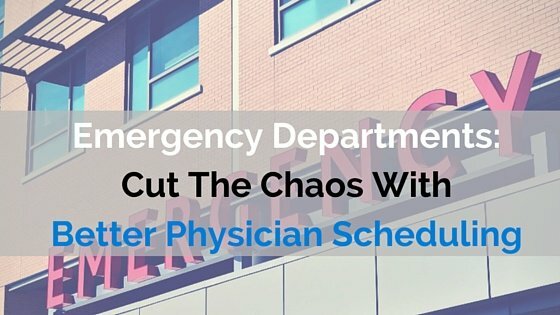 Emergency departments face unique, and possibly more difficult, challenges than others because the cases involved create a chaotic, unpredictable environment. 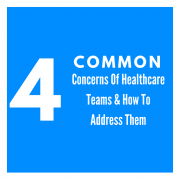 Healthcare administrators have the power to improve that reality for everyone by acknowledging these challenges and changing the way staff schedules are managed on a monthly basis. 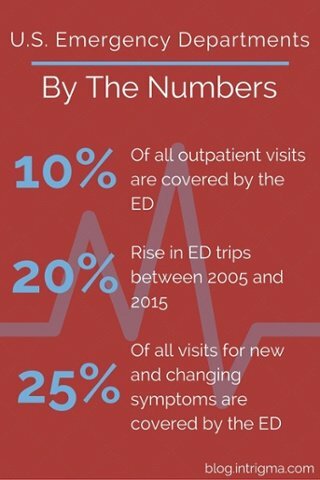 Emergency departments are so chaotic partially because they are frequently utilized by the less fortunate and uninsured, since EDs cannot turn away patients because of their inability to pay, unlike doctor’s offices. Some hospitals have faced serious understaffing concerns in their EDs–in one instance, two ED patients at one hospital died in the same month, possibly because there weren’t enough physicians, nurses, or physician assistants on the floor at the time. An environment like that is a breeding ground for stress, exhaustion, and burnout for the providers; none of these are states of mind that would bode well for either the providers or their patients, especially if the patient’s state is critical. Pediatric EDs not only have to deal with the same challenges outlined for adult EDs, but they also have their own challenges unique to the patients they attend to. The patients in this department can be treated by hospitalists, but they benefit more from being attended to by providers trained in the pediatric specialty. One study has noted that pediatric patients treated in the adult ED don’t receive the best possible care unless there’s a pediatrician on shift. In addition, when pediatric ED providers have to examine and treat children, they’re dealing with patients who can’t always verbalize their symptoms and who may resist examination out of fear or confusion. This makes diagnosis more time-consuming, so any administrative solution that brings relief to the stress would be welcome. That’s where scheduling comes in. Pediatric and adult emergency departments are strongly related in the sense that scheduling the providers attentively can greatly benefit the flow of productivity in each department. Potential understaffing is usually a risk in all departments, but even more so in emergency medicine. Data analysis is a valuable tool in this situation, since data about the ED can provide a basis for improving efficiency. Numbers like how productive each provider is, how many working providers would reduce wait time for a certain volume of patients, etc. can help the ED to anticipate staffing needs for slow and busy time periods. Using that data to build the schedule can ensure that providers are always available when they are needed. 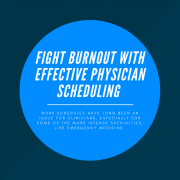 This is, of course, a delicate balance, because while patients need to be seen as soon as possible, providers also shouldn’t be left overworked. Since data analysis involves a significant amount of number compilation and calculations, this can’t be done effectively through any medium other than scheduling software. The most worthwhile software centralizes the entire scheduling process and tracks shifts, quotas, and more for each provider. It also has the option to generate reports of all sets of data it collects from the schedule each month. 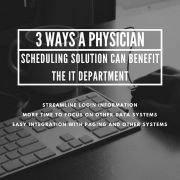 With data presented in a neat package to the scheduler, analyzing the numbers becomes that much easier and brings them one step closer to a well-scheduled department and, best of all, productive providers and satisfied patients. 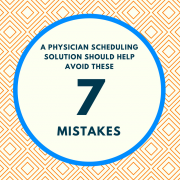 Interested in what software can do for ED scheduling? Cut the chaos with our free scheduling solution.